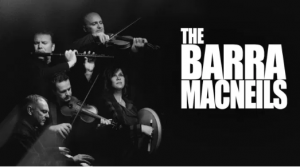 Iconic Cape Breton band/family The Barra MacNeils have graced the ears of the East Coast once again with their newest album On The Bright Side. The ten-track recording is packed with everything an islander loves; an abundance of the fiddle, a jig here and there, and even Cape Breton staples like a full Gaelic track are present in The Barra MacNeil’s latest. Beginning with the lovely little jig “Welcome to Boston,” the siblings establish their Cape Breton roots right off the bat. Building into a foot-tapping jam before dipping in energy and ending with a heavy spark of energy and harmony, the introductory piece is an island staple with a contemporary kick to it. “Jug of Punch” then takes this distinct islander vibe and swells it to perfection. With a mixture of the deep, march-worthy drumbeat, the pronounced singing technique and some non-verbal vocals that are nothing short of charming, “Jug of Punch” is easily among the album’s best. Retaining that vocal style, the album’s third track, “Livin’ The Dream,” is unique since it is the single that was released last year. A deep, almost growl-like bass accompanies the light-hearted hymn that creates that feeling of home. Following is another staple of Cape Breton’s music culture: a track sung completely in Scottish Gaelic with the name “Ribhinn Donn,” meaning “brown-haired maiden.” One need not speak the language to pick up on the powerful emotion emitting from the track; the gentle lull of voice and string coupled with the small flute piece at the end tells listeners all they need to feel. Elsewhere, “Saratoga” and “Mademoiselle Gallant” add some more fiddle-heavy instrumental songs to the mix, with the latter offering up a waltz-esque vibe. “Daisy,” using its beautifully catchy melodies, seems to explain the dangers of the world to a pure-hearted individual, and “The Underachiever” pulls a 180 on the instrumentals by only utilizing vocals, making it an interesting take on the theme of death. Finally, “The Way Old Friends Do” is a heart-wrenching testament to ever-lasting friendship, and it is bound to drop a nostalgia bomb on listeners of all ages. The Celtic music powerhouses are no strangers to success, and On The Bright Side is bound to be a pleasing return for listeners old and new.